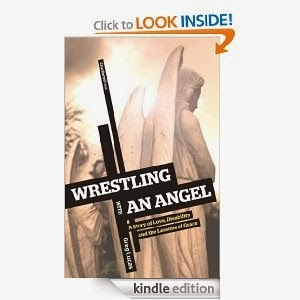 Greg Lucas story in Wresting with An Angel included a great deal of inspiration for me personally and has much to teach about the presence, power and goodness of God when parenting a child with disabilities. But whether or not your life circumstances are at all like Greg’s, I believe you’ll find something very valuable in reading this excerpt from his story today. “Folding my arms on top of my cluttered desk, I lay my head down, finally and openly broken. I vividly recall asking God to take my life, thinking how easy death must be compared to all the suffering and heartache of the past few years. But like so many times in my undeserving existence, instead of sending death, God sent grace. The grace that brought the gospel of hope into our hearts sixteen years earlier would once again, through much suffering, prove faithful and amazing. True desperation is always the most fertile ground for God’s grace to produce an abundant harvest of hope. And each time God has shown us His greatest glory, He has always first revealed our greatest despair. I am not one to implore the Lord to speak to me, open a Bible at random, and blindly place my finger on a passage of destiny. Yet I am very much aware of His voice in the written Scriptures, and of the power of His providence to place the right words at strategic moments before my obstinate mind and feeble eyes. …Letting go is always difficult. For parents, one of the most anxious, heartbreaking moments is when your child must be released into the world to take his or her own way in life. It is not simply the prospect of independent living that we find frightening. It is knowing that as we send our children out, life will inevitably serve up lessons involving failure and danger and risk. But when that child is severely disabled and entirely dependent on your care, guidance, protection and nurture—a child who has no voice, no ability to defend himself, no way of negotiating through these lesson of life—letting go seems more like the malpractice of accidental amputation than the outcome of successful surgery. But Kim and I have learned that faith means deciding, acting and committing to a course of action without fully understanding how things are going to work out. We also know that it is not our faith that contains the power to deliver—it is the object of our faith that both holds the power and determines the outcome. And when you see that the object of your faith is greater than anything in the universe, letting go is no longer the same things as giving up. Beneath the death grip of every parent holding tightly to their special needs child is the strong, reliable, and gentle hand of a Father who will never let go—the Deliverer, the Surgeon, the reliable object of our faith. Suffering reveals our need, and our need reveals the Savior. He will direct your life in whatever in whatever way is necessary to loosen your grip—not to take something away, but to make possible more than you could have ever hoped for or imagined. If you have a Glory Story to share, please write us at info@walkrightin.org. Glory Stories are the experiences we live and talk about that point others to the power, presence and goodness of God. What are you learning about God? How do you struggle in faith and how has God been showing you answers to questions? Has God surprised or encouraged you in some way lately? Tell someone! Powerful and a lesson for all of us.